This weeks draw for Swinford GAA 50/50 draw was held in Gateway Hotel on 29th December and Jane McNicholas of Oakdrive won €1,000.00. Envelopes are available in most business premises and online through www.swinfordgaa.ie where tickets can be purchased in bundles of 10/25/52 weeks. Next draw in Whitehouse on the 5th January. Draw envelopes are now also available at 3 for €5. 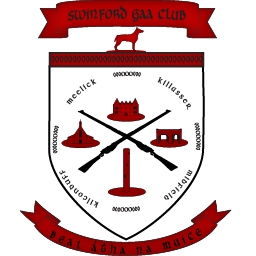 Swinford GAA club wishes all its members, players, managers, coaches and supporters a very Happy Christmas and Prosperous New Year. Swinford GAA Club held a great night in the Gateway Hotel on Tuesday 29th in recognition of all our underage teams. Many thanks to our guest of honour Mayo Captain Keith Higgins. Hi im wondering what day u6 class is on?.